Having a misaligned column problem? If you're having a misaligned column problem similar to the screenshot shown below, check out our new post at https://choung.net/howto/token2shell-md/screen-font-option-and-misaligned-columns. It explains why such problem occurs and offers some solutions. https://choung.net/data/wp-content/uploads/2015/09/t2s-md-358x358.png 358 358 Support Team /img/choung-logo.png Support Team2015-09-14 13:17:162015-09-14 13:23:24Having a misaligned column problem? We made a list of free monospaced fonts that seem suitable for text terminals. They all support TrueType or OpenType format thus you should also be able to use them from other software once they are installed on your Windows. The list is available at https://choung.net/howto/token2shell-md/free-mono-fonts. We now have Token2Shell/MD for Windows 10. This new Universal app is available through Windows Store and can also be used just like traditional Windows programs. However, due to differences in underlying technology, Universal apps have more restrictions then traditional programs. Thus we'll keep developing the original Token2Shell as well as the new Token2Shell/MD. The original Token2Shell will be focusing on compatibility with previous versions of Windows and performance optimizations. All in all, we'll be releasing a new version of Token2Shell for Windows shortly. The new version focuses on updating underlying development tool chains and libraries. There won't be any significant changes in user interface. Instead, the new version will be more optimized and include additional features to support more wide range of SSH servers out of the box. It'll also be offered free of charge to existing customers. This new version fixes the site license detection problem in Token2Shell.SSHpf. You can now purchase a “Site License” for Token2Shell. Token2Shell requires an Internet connection to have its license activated. Our method is simple and straightforward, yet good enough to minimize the piracy of our software. However, we understand that in some situations, our current license activation via the Internet method is unfeasible. In order to support our users in such environment, we now offer a "Site License" option for Token2Shell. This new "Site License" does not require an Internet connection and allows unlimited number of license activations per site. If you're interested in purchasing a "Site License", please contact sales@choung.net. 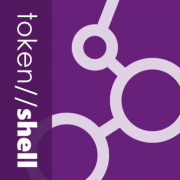 https://choung.net/data/wp-content/uploads/2013/11/token2shell-hdr.png 400 400 Support Team /img/choung-logo.png Support Team2014-03-06 08:08:222014-03-06 08:10:18You can now purchase a "Site License" for Token2Shell. Token2Shell can now automatically replace invalid file name characters (\/:*? "<>|) according to your preference when downloading files. Default replacement characters are chosen from Unicode characters that look similar to the characters they are replacing but allowed for a file name (ex. Unicode halfwidth/fullwidth forms). If you wish to replace all invalid characters to a single character, you simply need to enter that one character to the option edit box. Trailing space and period characters are also automatically replaced with U+00A0 (NO-BREAK SPACE) and U+00B7 (MIDDLE DOT) respectively. For your information, unlike Windows OS, you can use any character for a file name in Unix-like OS's such as Linux and FreeBSD. However, in order to minimize compatibility issues, we recommend avoiding the characters that cannot be used for a file name in Windows OS (\/:*?"<>|). Also, you should avoid adding trailing space and period characters. Slow Paste now has an option for ignoring blank lines. Instead of pasting text from clipboard, you can also Slow Paste text from a file by using Command Macro. 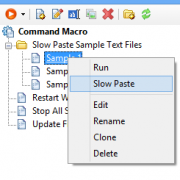 You simply need to create your text file in Command Macro pane, and right-click on that file item and select "Slow Paste". This version fixes the home folder setting problem with Token2Shell.SSHpf (SSH port forwarding program included with Token2Shell). You now have more options for serial port hardware flow control settings. When you open a Token2Shell address book entry file directly from Windows file manager, it's now opened in already running and not-minimized Token2Shell instead of launching a new Token2Shell instance. You can now generate an SSH2 public key from a private key file within Token2Shell. Holding down key while clicking "New" toolbar button or menu on main window now launches a new instance of Token2Shell. Holding down key while clicking "Address Book" toolbar button or menu on main window now opens currently set address book folder in Windows file manager. The new version also includes minor bug fixes and enhancements. You can now do "Slow Paste" with macro files. When you choose "Slow Paste" for a macro file, Token2Shell sends the content of the file line by line at a certain interval. Token2Shell supports the same set of interval options for macro files as the "Slow Paste" for clipboard stored text. The new version also includes other minor bug fixes and enhancements.